Though Buckingham was referring to the stylistic departure of 1979’s experimental opus Tusk, it’s a mentality that speaks to the band as a whole. At a time when many of their classic-rock peers have devolved into nostalgia-driven caricatures of themselves, Fleetwood Mac remains unapologetically authentic. Never far from emotional tumult, the band closed out its 63-date world tour Monday night with the return of bassist John McVie, who left the band to undergo cancer treatment this fall, delivering a relentless three-hour set of classics and deeper cuts that left the crowd and the band in tears. The group stripped away much of the gentleness and restraint that characterizes its best-known work—particularly Rumours—to highlight the rawness and desperation that underscores it. The result is a honed, aggressive sound that throws a gauntlet to both contemporaries and the Haims and Fleet Foxes of today, who owe the band more than a small debt. The quartet, backed by five auxiliary musicians, ripped through songs like “Go Your Own Way” and “The Chain,” during which Buckingham snarled, “Damn your love/Damn your lies” before bringing the crowd to its knees with a vicious, drawn-out version of the song’s signature solo—and that was just the beginning of the set. Fleetwood Mac also performed two new tracks from April’s Extended Play EP. The jaunty power-pop of “Sad Angel” evoked a less highfalutin Arcade Fire, while the rediscovered Buckingham-Nicks demo “Without You” showcased the warmth that still remains between the former lovers. More impressive than the delicate moments of chemistry between band members—the crowd collectively swooned at Buckingham and Nicks’ embrace at the end of “Sara”—might be their fortitude. The group embarked on a nearly hour-long encore that saw one feverish, climactic rendition topped by another, leaving one to wonder how they had any songs or emotional capacity left. And yet somehow, they left you wanting more. 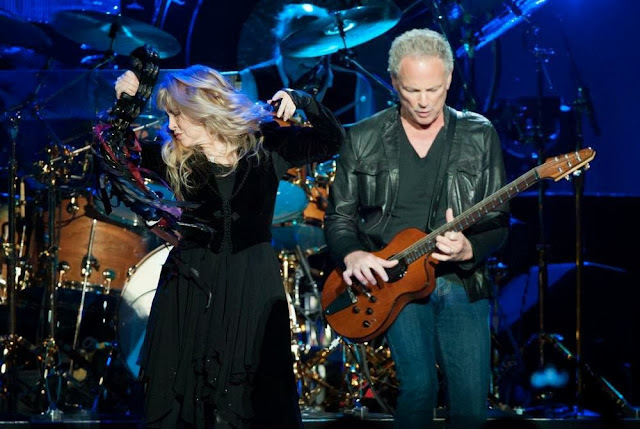 “There’s a few more chapters left in the book of Fleetwood Mac,” Buckingham declared towards the end of the set, before closing a final time with a wrenching, slowed down version of 2003’s “Say Goodbye.” Penned by Buckingham as a form of closure with Nicks, the song hushed the crowd as Nicks cried her way through her part. It’s perhaps trouble with goodbye that keeps Fleetwood Mac young, in the rawest sense of the word—and why its performances will never be about recalling their heyday, but giving redefined meaning to a continued journey. What a wonderful, perceptive and appreciative review to cap a hugely successful chapter of Fleetwood Mac - their 2013-14 tour. For anyone who thinks Stevie has had cosmetic surgery, you need to look at this picture close up, which proves that she hasn't. She is still a VERY beautiful woman. Big news will be coming soon so stay tuned everyone!! !